School bus drivers know better than anyone the special responsibilities they have on the road. Maneuvering a bus is a greater challenge than a car, and of course, with the precious cargo school bus drivers guard in their back seats, a bus driver bears a lot of responsibility.Add to that the hazards of driving in extreme weather, and things get serious fast. Fortunately when the roads get wet there are some simple steps bus drivers can take to keep themselves and their students safe. Storms and heavy rain conditions can lead to limited visibility, vehicle control problems, extreme temperatures and other high-risk conditions. Even light rain can lead to seriously slick roads. These conditions can lead to serious and risky situations on the roads, such as hydroplaning. Before getting in a school bus to drive, drivers should check the weather report so they know what kind of conditions they should expect throughout the trip. Also, check your tires and windshield wipers to make sure they are functioning properly. Make sure you have plenty of washer fluid, and that the window defrosters are working properly. When driving in rain, go slow and test your brakes—it can take up to twice the distance to come to a stop on wet roads. To reduce the risk of hydroplaning, come to a stop gradually. Likewise, when pulling into a new lane or turning onto a new road, give the other vehicles extra space to allow for the extra braking distance and the possibility that could spin out as you accelerate. Avoid aggressive or sudden stops and other steering, and be especially careful when driving through puddles. Especially be alert for problems in the first ten minutes or so after it begins to rain regardless of how light the rain might be. This is the most dangerous time, as the rain mixes with oil from vehicles and on the road (especially if there is new asphalt), and makes the roads slick. After this period this risk decreases, as the rain washes the oil away. In heavier rain, look for moving water on the sides of the road. Even after rain stops, this creates an increased risk for hydroplaning, when the bus’s tires loose traction with the road causing the driver to lose control. When it’s raining, buses should reduce their speed by half. 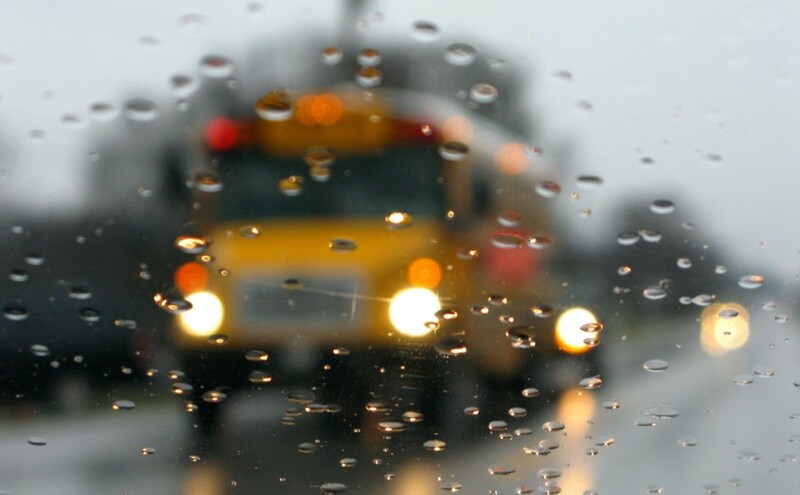 If a bus hydroplanes, taking the right actions can help reduce its duration, and the risk. Though it may be a driver’s first instinct, don’t slam on the brake. Instead, release the accelerator, which will let the wheels turn freely and slow down. If in a bus with an automatic transmission, downshift one gear. If you have standard transmission, the bus will slow down more on its own, but shift to neutral or depress the clutch to let the wheels turn freely if they start to skid. Buses with standard transmission will slow down at more quickly than those with automatic transmissions. Bus drivers face many risks out on the road, and take on the great responsibility of protecting the children of their communities. In rain, as with any weather situation on the roads, a cautious driver is a safe driver. Above all else, slow down and stay alert.